← What would Gandhi say about Barbados and its politicians? Ping Yark asks – DLP UK Chapter Money Scandal. Where did all the money go? New Issue of Ping Yark! 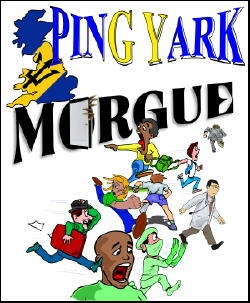 In the U.K. there is an irreverent newsletter called Ping Yark – published by homesick Bajans for other homesick Bajans. Leigh Bourne and a handful of others who refuse to surrender to Londontown publish Ping Yark quarterly in the U.K. … or to be more accurate…”more-less” quarterly. Holding the newsletter in your hands, and turning each page, you will be rewarded with memories, current politics and many oh-so-secret secrets of the elites. In search of Bajan cou cou. How “innovation” caused internationally famous chef Gary Rhodes to slag our national dish. Phil Sealy now an MBE. Well deserved! Buried Alive in Barbados: The Scantlebury story. The Heavy vs The Heavyweight. Mia Mottley: Interim leader? Owen Arthur wants his party back!